Product prices and availability are accurate as of 2019-04-18 07:32:46 UTC and are subject to change. Any price and availability information displayed on http://www.amazon.com/ at the time of purchase will apply to the purchase of this product. We know how much you care about your kid's safety, let alone what products to put on their skin, that's why we've created a face paint that's great for all skin types, even sensitive skin. It's water based but goes on smooth like an oil based paint. It goes on well and vibrantly, and stays on for hours! It's relatively easy to wash off in most cases with water and soap, but for some colors you may need to use make up remover. This paint feels comfortable when dried and very natural, and always brings excitement, giggles and laughter. If you want to save money, and make a bunch of kids happy for just a few bucks at the same time, this face paint set is for you. Click "add to cart" now before we run out of stock or price goes up. PLEASE NOTE: Pictures on the box are just a representation. YOUR KID'S SAFETY IS OUR TOP PRIORITY: All of our ingredients were laboratory-tested and are 100% FDA compliant. The contents are hypoallergenic, non-toxic, very safe and most importantly: there's no need to worry about the paint causing allergic reactions or creating eczema flare-ups. Nevertheless we highly recommend you to test the face paint on a small area first. 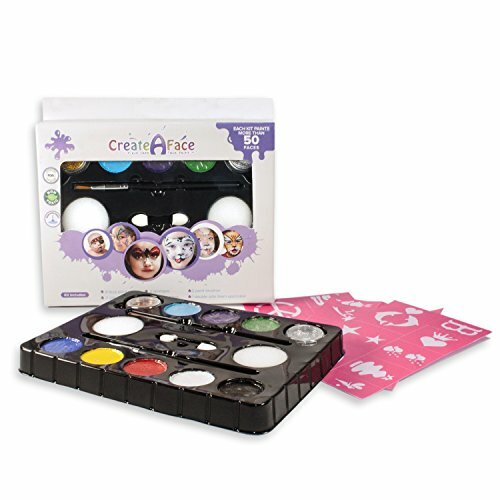 PAINTS 50 - 80 FACES: This paint goes on very smooth and stays on well (many hours if you want it to) These colors blend very easily with each other so you will have no limits to create your own color palette with our 8 base colors. Depending on how much paint you use on each face project you could easily paint more than 50 faces, but that's just a reference and your results may be different. DRIES FAST AND STAYS ON FOR HOURS: Why wait 5 minutes when your kids can start having fun within 60 seconds? Our paint dries very quickly and the child can begin having fun immediately. 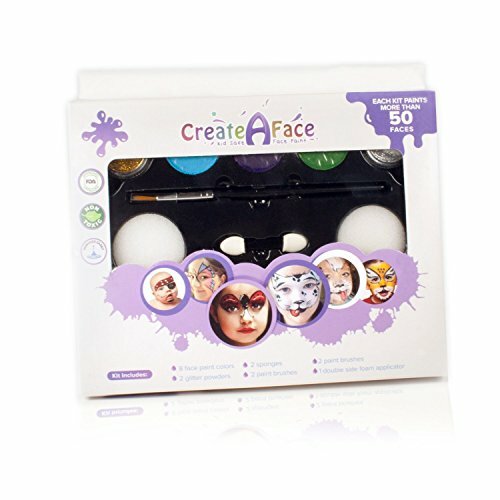 Our face paint can be removed quickly and easily with a damp cloth, baby wipes... or in extreme cases with make up remover. 32 POPULAR STENCILS & COMPLIMENTARY DESIGN GUIDE EBOOK. Never again get stuck with no ideas for face designs. 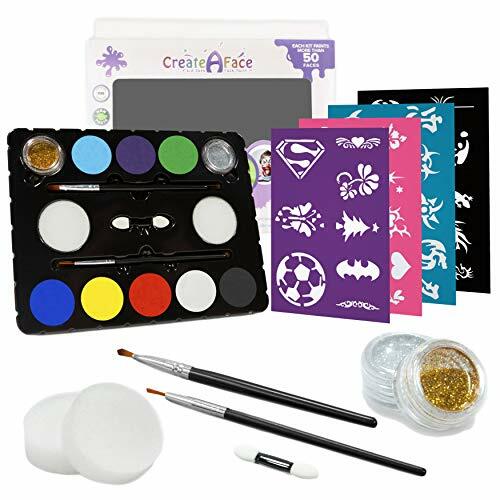 We've included 24 of the most popular unisex stencils in the kit, plus a complementary ebook with 18 face paint ideas for you to choose from. Keep in mind that pictures on the box and in the ebook are just a representation, your designs could be different. NO-QUESTIONS-ASKED MONEY-BACK GUARANTEE. In the unprecedented event you're not happy with this product, at any time, just contact our store and we'll issue a prompt refund.